For this visualization, I wanted to somehow simplify the complex world of immersive digital technology. With hundreds of new devices, software applications, virtual communities, augmented reality experiences and the like, my hope was to try and create a grid that would compare many of these technologies side-by-side. You can explore the interactive version of this grid on Tableau Public. 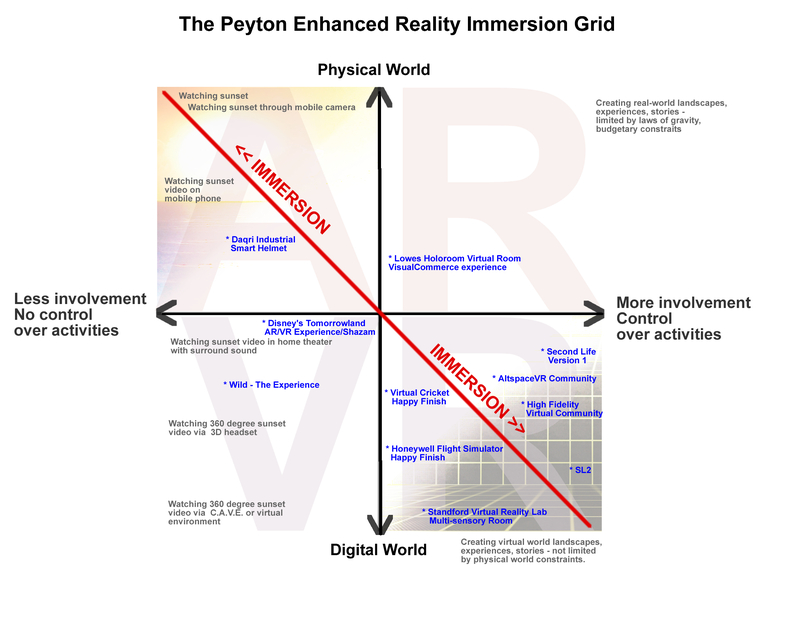 My first question was to explore what ‘Immersion’ actually means and try to establish some core components. Wikipedia outlines virtual reality ‘immersion’ as “the state of consciousness where an immersant’s awareness of physical self is diminished or lost by being surrounded in an engrossing total environment.” Webster’s dictionary simply defines ‘Immersion as ‘deep mental involvement’. So what are the psychological forces that help drive an immersive experience or help to create ‘deep mental involvement’? Keeping these concepts in mind, I have drafted a grid that attempts to show a scale for the values of involvement or agency on the Y axis and a scale for the amount of digital technology on the X axis. I have then plotted several real-world examples (shaded blue) of both augmented and virtual reality applications on the grid. Nakamura, J.; Csikszentmihalyi, M. (20 December 2001). “Flow Theory and Research”. In C. R. Snyder Erik Wright, and Shane J. Lopez. Handbook of Positive Psychology. Oxford University Press. pp. 195–206. ISBN 978-0-19-803094-2. Retrieved 20 November 2013.